Objective The objective of this study was to compare international trends in pre-eclampsia rates and in overall pregnancy hypertension rates (including gestational hypertension, pre-eclampsia and eclampsia). Design Population data (from birth and/or hospital records) on all women giving birth were available from Australia (two states), Canada (Alberta), Denmark, Norway, Scotland, Sweden and the USA (Massachusetts) for a minimum of 6 years from 1997 to 2007. All countries used the 10th revision of the International Classification of Diseases, except Massachusetts which used the 9th revision. There were no major changes to the diagnostic criteria or methods of data collection in any country during the study period. Population characteristics as well as rates of pregnancy hypertension and pre-eclampsia were compared. Results Absolute rates varied across the populations as follows: pregnancy hypertension (3.6% to 9.1%), pre-eclampsia (1.4% to 4.0%) and early-onset pre-eclampsia (0.3% to 0.7%). Pregnancy hypertension and/or pre-eclampsia rates declined over time in most populations. This was unexpected given that factors associated with pregnancy hypertension such as pre-pregnancy obesity and maternal age are generally increasing. However, there was also a downward shift in gestational age with fewer pregnancies reaching 40 weeks. 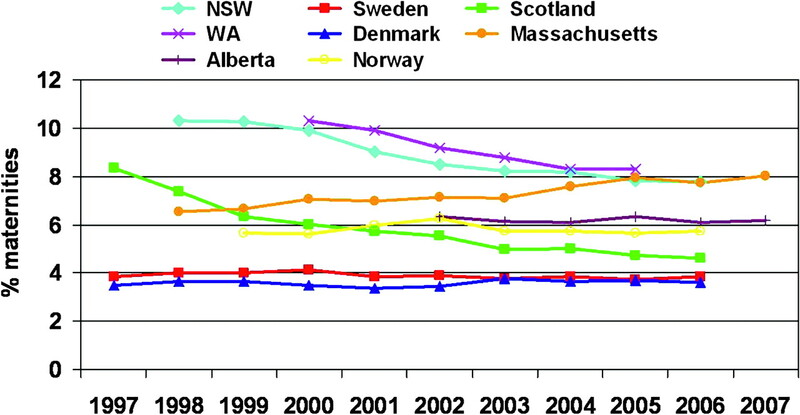 Conclusion The rate of pregnancy hypertension and pre-eclampsia decreased in northern Europe and Australia from 1997 to 2007, but increased in Massachusetts. The use of a different International Classification of Diseases coding version in Massachusetts may contribute to the difference in trend. Elective delivery prior to the due date is the most likely explanation for the decrease observed in Europe and Australia. Also, the use of interventions that reduce the risk of pregnancy hypertension and/or progression to pre-eclampsia (low-dose aspirin, calcium supplementation and early delivery for mild hypertension) may have contributed to the decline. The population prevalence of factors associated with increased and decreased risk of pregnancy hypertension and pre-eclampsia has changed over time, but the impact of these changes is unknown. International comparisons of absolute population rates of pregnancy hypertension and pre-eclampsia are hindered by different diagnostic criteria and methods of data collection. Comparing trends between countries overcomes the difficulties in comparing absolute rates. Pregnancy hypertension and/or pre-eclampsia rates declined over time in northern Europe and Australia, but not Massachusetts (USA). Declining hypertension rates were accompanied by a downward shift in gestational age with fewer pregnancies reaching term, the time when the pregnancy hypertension and pre-eclampsia are most likely to occur. Strengths include numerous validation studies indicating that the hypertensive disorders are reliably reported in the population data sets used for the study and the consistency of trends across most countries. Limitations include a different International Classification of Diseases coding version in Massachusetts and lack of available information on clinical interventions. Risk factors for pregnancy hypertension and pre-eclampsia have been well documented.2 7–13 Factors that increase risk include nulliparity, older maternal age, multiple births, diabetes, chronic hypertension, obesity, previous pre-eclampsia, family history of pre-eclampsia, a new partner and/or ≥10 years since last pregnancy, renal disease, and the presence of antiphospholipid antibodies.2 7–9 11 13 14 Decreased risk of pregnancy hypertension and pre-eclampsia has been associated with placenta praevia, smoking (although smoking may only be protective in the non-obese), summer births, low-dose aspirin and calcium supplementation in high-risk women, treatment of gestational diabetes and use of antihypertensive medications.2 9 10 12 15–19 As the majority of cases of pregnancy hypertension and pre-eclampsia occur at term, increasing rates of early elective delivery may reduce their frequency.20–23 Trends in pregnancy hypertension and pre-eclampsia are the result of the effects of changes in all these factors. There are few recent reports of population trends in pregnancy hypertension.26–28 International comparisons of absolute population rates of pregnancy hypertension and pre-eclampsia have been considered ‘virtually impossible’ because of different diagnostic criteria and methods of data collection.30 However, comparing trends between countries overcomes the difficulties in comparing absolute rates. Provided that methods of reporting do not change from year to year, temporal variations in each country reflect true changes in that country's rate of hypertension. The aim of this study was to determine and compare population-based trends in pregnancy hypertension and pre-eclampsia in high-income countries. We used population health data (record-linked birth and hospital data where available) to determine pregnancy hypertension and pre-eclampsia rates in Australia, Canada, Denmark, Norway, Scotland, Sweden and the USA. We pre-specified that (1) participating centres had to provide a minimum of 6 years of data in the period from 1997 to 2007, and (2) if coding of hypertension was based on the International Classification of Diseases (ICD), the same ICD version had to be used for the entire period. The latter stipulation was made because pre-eclampsia coding in ICD-9 and ICD-10 are not comparable. The study populations included all women who gave birth (both live births and stillbirths) during the study period. Eight collaborating centres provided population health data on a regional or national basis, including: Australia (the states of New South Wales (NSW) and Western Australia (WA)), Canada (province of Alberta); Denmark, Norway, Scotland, Sweden and the USA (state of Massachusetts). Table 1 provides the average population, number of births and information on the data sources in the eight study areas. The two Australian states account for approximately 43% of Australian births and together are referred to as ‘Australia’ in this paper. With the exception of the USA, all participating countries have universal health coverage for maternity care provided by midwives, general practitioners and obstetricians. Australia also has a parallel private healthcare system similar to that in the USA; about one-third of women seek private obstetric care. Population health data were obtained from birth and/or hospital records in each study area. Birth data including information on maternal characteristics, pregnancy, labour, delivery and infant outcomes were collected by the attending midwife or doctor in a standard format. In Scotland, clinical coding staff within each hospital's medical records department extracted the birth data from all available medical records. Hospital data included demographic, administrative and clinical data for all hospital discharges. Diagnoses and procedures for each admission were coded from the medical records according to the ICD. The number of diagnosis fields available in each medical record varied by study area, ranging from 6 to 25 (table 1). However, a consistent number of fields were used within each country over the time period of the study. Record-linked birth and hospital data were utilised in Australia, Denmark and Massachusetts. In Denmark, the availability of a unique identifier allows unambiguous, deterministic linkage of records for each woman. In Australia and Massachusetts, unique identifiers are not available for record linkage. Consequently, probabilistic linkage methods were utilised. This involves a complex process of blocking and matching combinations of selected variables (such as name, date of birth, address and hospital) using record-linkage software.31 Probability weights are calculated, adjusted for incomplete and missing data, and used to determine correct matches. The validity of the probabilistic record linkage is extremely high, with less than 1% of records having an incorrect match.31–34 Once linked, and prior to release for analysis, records are stripped of identifying information. Information on maternal hypertension status was available from birth and/or hospital data (table 1). In the birth data, gestational hypertension, pre-eclampsia (in some cases by severity) and eclampsia data were generally collected as check-box fields and/or free text fields that were coded according to the ICD. In all hospital data, hypertension (as diagnosed by the attending clinician) was coded from the medical record according to the ICD. Because of expected variations in reporting and/or coding, we made an a priori decision that the optimal identification of pregnancy hypertension and pre-eclampsia would be based on local knowledge of reporting methods and validation studies of hypertension reporting. We aimed to achieve the best and most consistent reporting in each study area. Since our focus was on trends over time, our key concern was to ensure that data collection and reporting within each study area were consistent over the study period. It was clear that differences in the baseline rates between study areas would be unavoidable. The collaborating centres provided information on maternal and pregnancy characteristics of the study populations including age, parity, smoking at registration and/or during pregnancy, ethnicity, overweight/obesity (BMI ≥25.00 kg/m2), diabetes, chronic hypertension, multiple gestation, induction of labour, mode of delivery and gestational age. Preterm birth (<37 weeks gestation) was categorised as spontaneous or elective (planned/elective caesarean section before the onset of labour or induced labour). Gestational age was reported in completed weeks, based on the best available estimate from ultrasound dating and/or menstrual history. The most reliable source (birth and/or hospital data) was used to determine exposures. The Publication Board at the Medical Birth Registry of Norway and the Danish Registry Board approved the study. In NSW, the record linkage was approved by the NSW Population and Health Services Research Ethics Committee (2006-06-011). No other permissions were required for analysis and presentation of the data. All analyses were based on women who delivered in each study location. We plotted secular trends in pregnancy hypertension and pre-eclampsia (per 100 deliveries per annum) for each study area based on available data over the study period. Temporal trends in numbers of pregnancy hypertension and pre-eclampsia events by study area were modelled using negative binomial regression. The covariance matrix was scaled by the deviance divided by the degrees of freedom and the additional variance component k estimated by maximum likelihood. Study year was fitted to the models, permitting estimation of yearly changes (with associated 95% CIs) in numbers of events relative to baseline. Model fit (p>0.2 in all models) was assessed using the Pearson χ2 goodness of fit statistic. Changes over time in population characteristics were analysed using the χ2 test for trend with the significance level set at p<0.01. Data were available from the eight study areas for periods of 6 to 10 years between 1997 and 2007. The maternity populations ranged in size from an average of 25 000 per annum (pa) in Western Australia to 100 000 pa in Sweden (table 1). 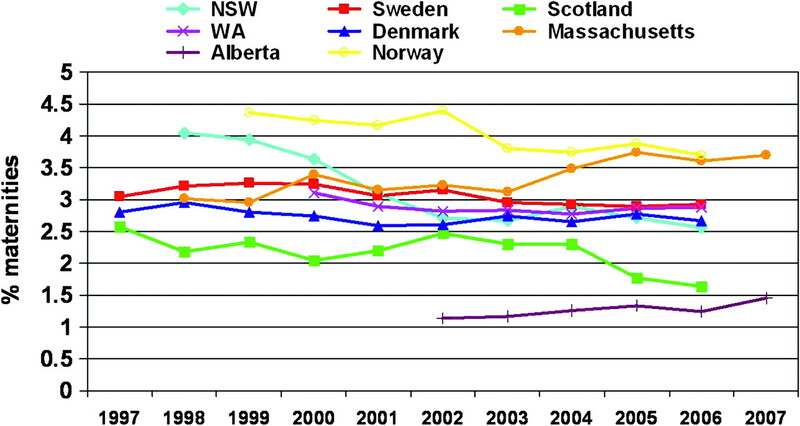 Although not measured from the same starting time or for the same duration, significant changes in the absolute number of women giving birth were observed in some areas, with increases in Alberta (by +26%), Sweden (+17%) and Australia (+7%), and declines in Scotland (–6%), Denmark (–4%) and Massachusetts (–4%). In Norway, deliveries declined from 1999 to 2002 (–6%) and then gradually returned to baseline in 2006. Details of maternal and pregnancy characteristics and trends for each population are presented in table 2, highlighting some differences between study areas. The proportion of women delivering their first baby ranged from 40.7% in Norway to 45.2% in Scotland, and increased in all populations. Multiple gestation rates were higher in Massachusetts, which also had the highest proportion of mothers aged ≥35 years. The Nordic countries (Denmark, Norway and Sweden) had lower rates of deliveries among teenagers, comparatively low rates of medical induction and operative deliveries (vaginal instrumental and caesarean deliveries), and lower rates of preterm birth. Maternal age increased over time in the Nordic countries, Australia and Scotland. Smoking declined, and inductions and caesarean sections increased in most study areas. Where data were available, there was a downward shift in gestational age at term with an increasing proportion of infants born at 37–39 weeks. This was accompanied by an increase in preterm births in NSW and Denmark. Information on the proportion of women who were overweight or obese was only available in Sweden (35.5%) and Denmark (32.1%). In Sweden, BMI information was available for 86% of women, and in Denmark data were available for 92% of women for 2004–2006, with no significant change in the rate of overweight or obesity during that period. As anticipated, the reported rates of pregnancy hypertension (3.6% to 9.1%), pre-eclampsia (1.4% to 4.0%) and early onset pre-eclampsia (0.3% to 0.7%) varied between study areas. The contribution of pre-eclampsia to the pregnancy hypertension rate also varied from 23% in Alberta to 74% in Sweden (median=41%). Figure 1 shows the trends in pregnancy hypertension rates for each study area. The average yearly rate decreased significantly during the study periods in four of the eight areas. In Scotland, pregnancy hypertension decreased by −6.2% pa (95% CI −5.2% to −7.3%), in WA by −4.8% pa (95% CI −4.1% to −5.5%), in NSW by −4.1% pa (95% CI −3.4% to −4.8%) and in Sweden by −0.6% pa (95% CI −0.1% to −1.1%). There was no significant change in the rate of pregnancy hypertension in Alberta (p=0.43), Denmark (p=0.23) or Norway (p=0.90), while in Massachusetts the rate increased significantly by 2.3% pa (95% CI 1.9% to 2.7%). International trends in pregnancy hypertension. NSW, New South Wales; WA, Western Australia. Trends in pre-eclampsia (figure 2) mirrored those of pregnancy hypertension in most study areas with significant decreases in NSW (–6.0% pa (95% CI −4.2% to −7.7%)), Scotland (–3.0% pa (95% CI −0.7% to −5.2%)), WA (–1.3% pa (95% CI −0.3% to −2.3%)) and Sweden (–1.2% pa (95% CI −0.6% to −1.8%)). A significant increase was observed in Massachusetts (2.4% pa (95% CI 1.5% to 3.3%)). Norway and Denmark experienced declines in pre-eclampsia rates (–2.5% pa (95% CI −1.4% to −3.5%) and −0.7% pa (95% CI −0.02% to −1.4%), respectively), despite the lack of significant reductions in pregnancy hypertension. In Alberta, the pre-eclampsia rate increased by 4.4% pa (95% CI 2.4% to 6.4%), albeit from a very low base rate of 1.1%. Where data were available, the trends in pregnancy hypertension and pre-eclampsia were similar when analyses were restricted to nulliparous women. International trends in pre-eclampsia. NSW, New South Wales; WA, Western Australia. Variability in the age, parity, chronic disease, smoking and multiple birth distributions will also influence the baseline rates of pregnancy hypertension and pre-eclampsia.2 7 12 Although data from Australia, the USA and Canada were from regional populations, these populations are likely to be more homogenous than the entire country populations and may be more similar to the European populations. Furthermore, the regional populations will have fewer climatic differences than experienced by entire countries like the USA, Canada and Australia. Finally, hospital data in all study areas, except Massachusetts, were coded using the 10th revision of the ICD. Unlike ICD-9, ICD-10 combines mild pre-eclampsia with gestational hypertension. While this should not affect the reported rate of pregnancy hypertension, it reduces the rate of pre-eclampsia in ICD-10 compared with ICD-9. The change in NSW from ICD-9 in 1997 to ICD-10 in 1998 coincided with a shift from an increasing to a decreasing trend in pregnancy hypertension, suggesting that the impact of the ICD version should not be disregarded. Furthermore, study areas with the highest rates of pregnancy hypertension (Australia and Massachusetts) have linked data and more diagnosis fields per record, characteristics shown to increase ascertainment in population data.29 36 Combinations of all these factors, as well as differences in the population of pregnant women, are likely contributors to differences in baseline rates between the study areas. Although inconsistencies in diagnostic criteria, study populations, and temporal, geographic and demographic factors may explain differences in baseline rates, they do not explain the observed trends in pregnancy hypertension and pre-eclampsia. The year-to-year trends are influenced by the prevalence of risk factors in the study populations, prenatal care and therapeutic interventions. Many recognised risk factors for pregnancy hypertension and pre-eclampsia increased in all or some of our study populations during the study period, including nulliparity, advanced maternal age, diabetes, chronic hypertension and multiple pregnancy, while smoking rates (an apparent protective factor) declined everywhere. Diabetes, chronic hypertension and multiple pregnancy are associated with a two- to threefold increase in risk of pre-eclampsia, but occur infrequently.2 9 Small changes in the prevalence of these factors are unlikely to have a large impact on pregnancy hypertension rates in the population. While advanced maternal age and obesity are more common, the magnitude of risk is lower (less than double).2 9 Although only a few countries could provide information on obesity in pregnant women, we assume that this is increasing in all participating countries, based on population trends. Nulliparity provides perhaps the most contrary and puzzling disparity in pre-eclampsia trends. Nulliparity is common (42–45%, increasing in most populations) and has an RR of pre-eclampsia estimated at 2.9 (95% CI 1.3 to 6.6).9 However, in our study, overall nulliparity rates did not correlate with the pre-eclampsia rates as expected. Instead, Scotland had both the lowest pre-eclampsia rates and the highest nulliparity rate, and Norway had the highest pre-eclampsia rates and the lowest nulliparity rate. Furthermore, the trends observed for all women were also observed among nullipara. Among multipara, pre-eclampsia in a prior pregnancy has been associated with a sevenfold increased risk in a subsequent pregnancy.9 Although women with pre-eclampsia are also less likely to have another pregnancy, this does not explain the lower overall risk of pre-eclampsia in parous women.11 Consequently, the impact of trends in parity on the population rates is complex and difficult to predict. A strength of our study is the quality of information collected from very different health systems. While variation may occur in reporting, completeness and validity of data, there were no major changes in data collection or reporting methods during the study period. Validation studies of the reporting of hypertension in pregnancy have been conducted in Australia, Canada, Denmark, Norway, Sweden and the USA, with consistent findings about the reliability of each country's ascertainment methods.24 25 29 37–39 44 This consistency is important when examining the year-to-year variation. In conclusion, we found declining rates of pregnancy hypertension and pre-eclampsia in northern Europe and Australia, a reassuring finding in the context of increasing maternal age, nulliparity and obesity. However, an increase in these rates was observed in Massachusetts. It is unclear whether the different ICD coding version used in the USA played a role in this finding. The role of elective delivery prior to the due date (especially late preterm and early term) in limiting the period of gestation during which the pregnancy hypertension and pre-eclampsia risks are greatest warrants further investigation. Population health data were generously provided by the Alberta Discharge Abstract Database and Birth Registry of Vital Statistics, NSW Department of Health, WA Department of Health, the Danish National Registry of Patients and Medical Birth Registry, the Medical Birth Registry of Norway, Information Services Division of NHS National Services Scotland, the Swedish Medical Birth Register and a public–private partnership between the Boston University School of Public Health, and the Massachusetts Department of Public Health, through a public–private partnership between with Boston University School of Public Health and the Centers for Disease Control and Prevention, USA. We thank the NSW Centre for Health Record Linkage and the WA Data Linkage System for record linkage. We are also indebted to S Hernandez-Diaz for introducing the Nordic members of the collaboration.
. The global impact of pre-eclampsia and eclampsia. Semin Perinatol 2009;33:130–7.
. The classification and diagnosis of the hypertensive disorders of pregnancy: statement from the International Society for the Study of Hypertension in Pregnancy (ISSHP). Hypertens Pregnancy 2001;20:IX–XIV.
. Report of the National High Blood Pressure Education Program Working Group on High Blood Pressure in Pregnancy. Am J Obstet Gynecol 2000;183:S1–22.
. The detection, investigation and management of hypertension in pregnancy: full consensus statement. Aust N Z J Obstet Gynaecol 2000;40:139–55.
. Adverse perinatal outcomes are significantly higher in severe gestational hypertension than in mild pre-eclampsia. Am J Obstet Gynecol 2002;186:66–71.
. Hypertensive disorders in pregnancy: a population-based study. Med J Aust 2005;182:332–5.
. Maternal and fetal genetic factors account for most of familial aggregation of pre-eclampsia: a population-based Swedish cohort study. Am J Med Genet A 2004;130A:365–71.
. Risk factors for pre-eclampsia at antenatal booking: systematic review of controlled studies. BMJ 2005;330:565.
. Etiology and risk factors for placenta previa: an overview and meta-analysis of observational studies. J Matern Fetal Neonatal Med 2003;13:175–90.
. Interactions between smoking and weight in pregnancies complicated by pre-eclampsia and small-for-gestational-age birth. Am J Epidemiol 2008;168:427–33.
. Abortion, changed paternity, and risk of pre-eclampsia in nulliparous women. Am J Epidemiol 2003;157:1108–14.
. The interval between pregnancies and the risk of pre-eclampsia. N Engl J Med 2002;346:33–8.
. Antiplatelet agents for prevention of pre-eclampsia: a meta-analysis of individual patient data. Lancet 2007;369:1791–8.
. Cigarette smoking during pregnancy and risk of pre-eclampsia: a systematic review. Am J Obstet Gynecol 1999;181:1026–35.
. Effect of treatment of gestational diabetes mellitus on pregnancy outcomes. N Engl J Med 2005;352:2477–86.
. Calcium supplementation during pregnancy for preventing hypertensive disorders and related problems. Cochrane Database Syst Rev 2006;(3):CD001059.
. Seasonal variation in pregnancy hypertension is correlated with sunlight intensity. Am J Obstet Gynecol 2010;203:215.e1–5.
. Obstetric intervention, stillbirth, and preterm birth. Semin Perinatol 2002;26:250–9.
. Induction of labour versus expectant monitoring for gestational hypertension or mild pre-eclampsia after 36 weeks' gestation (HYPITAT): a multicentre, open-label randomised controlled trial. Lancet 2009;374:979–88.
. Obstetrical intervention and the singleton preterm birth rate in the United States from 1991–2006. Am J Public Health 2010;100:2241–7.
. Trends in induction of labour, 1998–2007: a population-based study. Aust N Z J Obstet Gynaecol 2009;49:599–605.
. Validity of pre-eclampsia-related diagnoses recorded in a national hospital registry and in a postpartum interview of the women. Am J Epidemiol 2007;166:117–24.
. Comparison of risk factors for pre-eclampsia and gestational hypertension in a population-based cohort study. Am J Epidemiol 1998;147:1062–70.
. Secular trends in the rates of pre-eclampsia, eclampsia, and gestational hypertension, United States, 1987–2004. Am J Hypertens 2008;21:521–6.
. Population-based analysis of hypertensive disorders in pregnancy. Hypertens Pregnancy 2007;26:67–76.
. The accuracy of reporting of the hypertensive disorders of pregnancy in population health data. Hypertens Pregnancy 2008;27:285–97.
. Summary of the NHLBI Working Group on Research on Hypertension During Pregnancy. Hypertension 2003;41:437–45.
. Probabilistic record linkage is a valid and transparent tool to combine databases without a patient identification number. J Clin Epidemiol 2007;60:883–91. Centre for Health Record Linkage. CHeReL Quality Assurance Procedures for Record Linkage: http://www.cherel.org.au/downloads.html (accessed Mar 2011). Western Australian Data Linkage System. http://www.datalinkage-wa.org/data-linkage/linkage-process (accessed Mar 2011).
. Maternal outcomes associated with planned primary cesarean births compared with planned vaginal births. Obstet Gynecol 2007;109:669–77.
. Quality of data in perinatal population health databases: a systematic review. Med Care 2011. http://journals.lww.com/lww-medicalcare/pages/default.aspx (accepted 31 Jan 2011).
. The reporting of pre-existing maternal medical conditions and complications of pregnancy on birth certificates and in hospital discharge data. Am J Obstet Gynecol 2005;193:125–34.
. International Classification of Diseases—9th revision coding for pre-eclampsia: how accurate is it? Am J Obstet Gynecol 2004;190:1629–33; discussion 33–4.
. Accuracy of obstetric diagnoses and procedures in hospital discharge data. Am J Obstet Gynecol 2006;194:992–1001.
. Non-proteinuric pre-eclampsia: a novel risk indicator in women with gestational hypertension. J Hypertens 2008;26:295–302.
. Current mamangement of pre-eclampsia. Med J Aust 2009;190:3–4.
. Periconceptional multivitamin use reduces the risk of pre-eclampsia. Am J Epidemiol 2006;164:470–7.
. association of periconceptional multivitamin use with reduced risk of pre-eclampsia among normal-weight women in the Danish National Birth Cohort. Am J Epidemiol 2009;169:1304–11.
. Classification of pre-eclamptic pregnancies in health registries. Pregnancy Hypertension 2010;1(S1):54. http://www.pregnancyhypertension.org/. Funding The research received no specific grant from any funding agency in the public, commercial or not-for-profit sectors. However, CLR was supported by a NHMRC Senior Research Fellowship (no 457078) and a McKern Travelling Research Scholarship. JBF was supported by NHMRC Capacity Building funding (no 573122), and CJW was supported by the Edinburgh MRC Hub for Trials Methodology Research. Contributors CLR and JBF conceived the project and developed the idea in collaboration with JMM, JC, JEN, JN and CJW. All authors contributed to study design, CLR, JC, SC, MK, KMM, NN, HTS and RW were responsible for data acquisition, and CSA, SA, SC, MG, KKM, AL, CM, RW and CJW contributed to the analysis of data. CLR and JBF initially drafted the manuscript, and all authors were involved in critical revision of the intellectual content. All authors approved the final manuscript.